In the midst of touring season, there is always another project to conquer, and there is always room for more people to help conquer them. 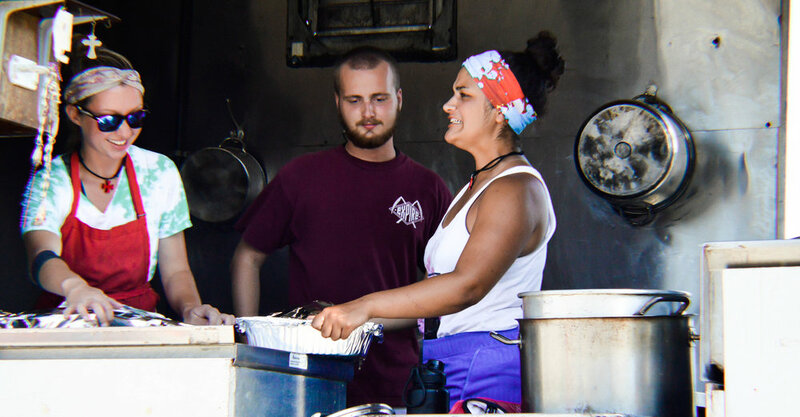 From driving a vehicle to assisting with the food truck, volunteers consistently help make the show happen. 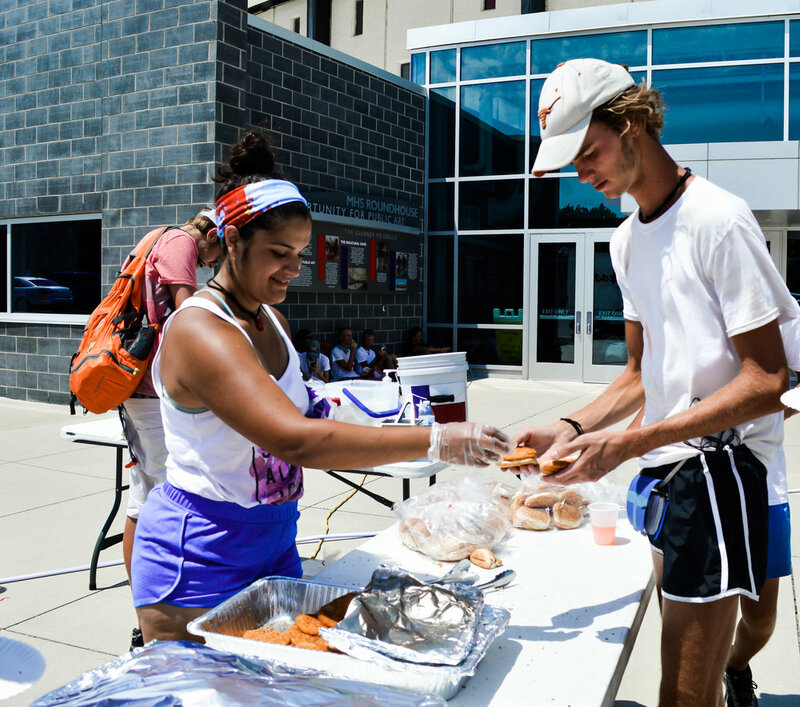 Volunteers are much more than luxuries when it comes to drum corps—often times they are an essential piece to the functionality of the organization. Whether it's for a day, a week, or the entire season, they play an important role in everything the drum corps is able to accomplish. "We really couldn't function without volunteers," said Volunteer Coordinator, Chelsea Stamet Davis. "As much as our administrative staff does, they can't be everywhere. We need the volunteer manpower." Much like the administrative team, the volunteer position is hard to define. It consists of whatever the present moment requires to help propel the drum corps, and provides a consistently full schedule. Tim Stephenson, who aged out with the Crossmen in 2015 and spent three weeks this summer volunteering, spoke briefly on his experience. "I did whatever I could find," said Stephenson. "I mostly drove, but I helped push the speakers, build props, make airport runs—I also washed my fair share of dishes." Volunteers also often-times bring a special or unique set of skills to the table that might not be present on the administrative staff. Whether people realize it or not when signing up, these skills can often prove to be more than helpful to the organization. "People who can work well with electronics or sewing, or people with CDLs are who we depend on to help us do drum corps," said Davis. From former Crossmen to parents of current members, volunteering is also a rewarding way to see the 'other side' of how a drum corps functions. 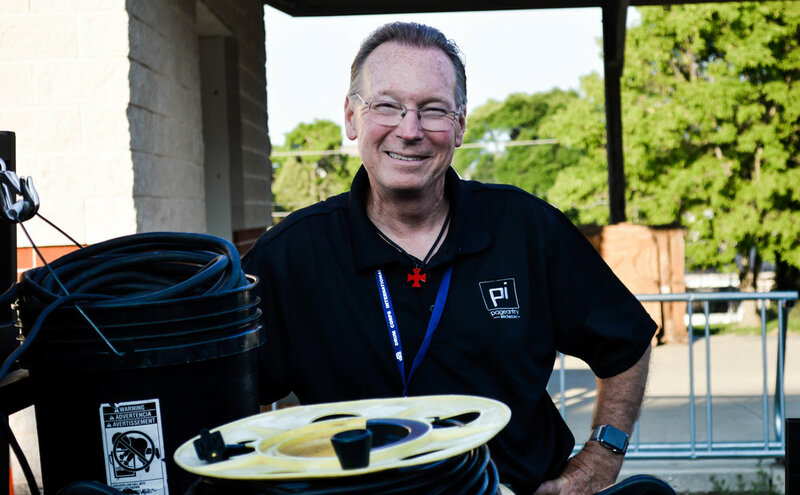 "As a volunteer, I really appreciated how much goes into the 'off the field' business of a drum corps," said Stephenson. "I thought I had a good idea of how much everyone works as a member, but now I understand how much everyone is doing behind the scenes to make the season special." Another volunteer, Austin Hager, who is spending his entire summer with the Crossmen, spoke on his time thus far with the corps. "I marched Crossmen Winds in 2017 and wanted to be hands-on with the corps for the summer," said Hager. "This has mad me realize how hard everyone works to make sure the members have everything they need." Volunteers give back to the organization in a truly exclusive way. Their bond with the members is morally uplifting while their logistical assistance keeps the corps up and running smoothly. The unique support that they provide helps to both better the corps and strengthen the family bond of everyone involved. The Crossmen are incredibly grateful to everyone who has poured into the lives of the members by taking time to help behind the scenes. It takes a lot of energy to continuously pour into a drum corps—to act hands-on with some of the most important logistics that go into the day-to-day maintenance of the Crossmen. For Executive Director, Fred Morrison, that energy is what drives him. It doesn't take long to notice how much passion he has for the wellbeing of the group and its members. On tour, Fred can often be found working alongside the administrative team to help the corps run smoothly. In between projects, Fred sat down and answered a few questions about his involvement in the activity and the 2018 Crossmen. What is your favorite part about being involved in drum corps? I’ve been around a lot of competitive people and activities. There’s a common denominator there of people trying to excel and be the best at what they do. It’s an exciting atmosphere and something that I really enjoy. Drum corps is one of the most difficult things I’ve ever done and ever been around. We’ve got 250 people involved, traveling down the road together. There are different logistics and personalities, and things that can and may go wrong. Those are really challenging, and I enjoy a challenge. What do you think makes drum corps unique? The most obvious thing to me is the number of people. The team on the field is over 150 people. I don’t think there’s another sport or competitive activity that requires that many people to come together as a team and perform at such a high level. What’s the biggest impression that the organization has left on you? It’s ongoing—the people. Interacting and building the relationships that you establish every year—watching the performers start off as strangers and developing life-long relationships with them. Those are powerful. I’ll have those forever. The simplest way to put it is that we’re all making memories together. What is your goal for this year's show? My biggest instruction to the design team every year is that they engage the audience. That is a big part of why we're here. The feedback that the audience gives to the performers is very important. What’s it like getting to watch the show come together throughout the season? First you see them develop as performers. As time goes on and they get more comfortable, they excel at it. They really inject themselves into the characters and the music. That’s been a fun process to watch. After nine shows and nearly a month on the road, the Crossmen have been busy. When rehearsal days come around, it's an important time for the corps to settle in and work to better the performance. Today and tomorrow, the members are in Marshalltown, Iowa, rehearsing before the next string of competitive shows. Chicken patties for lunch--a staple favorite of the corps. On a football field in the distance, the drum corps is repping a chunk of their show, working out the details until the instructional staff decides that it's been cleaned well enough to move on. The sound of running water comes from the food truck, and administrative staff members are scattered about: one sewing a member's uniform, a handful working to repair a malfunction on the equipment trailer, another pulling into the housing site from a grocery run. Every great production has a behind-the-scenes team that works around the clock to ensure that the process runs smoothly. For drum corps, that team comes in the form of the administrative team. The nature of an administrative team is to be the invisible gears that help power the machine of the drum corps. With the Crossmen, that means working behind the scenes to ensure that the members have the best experience possible. So, what exactly does "administrative team" entail? 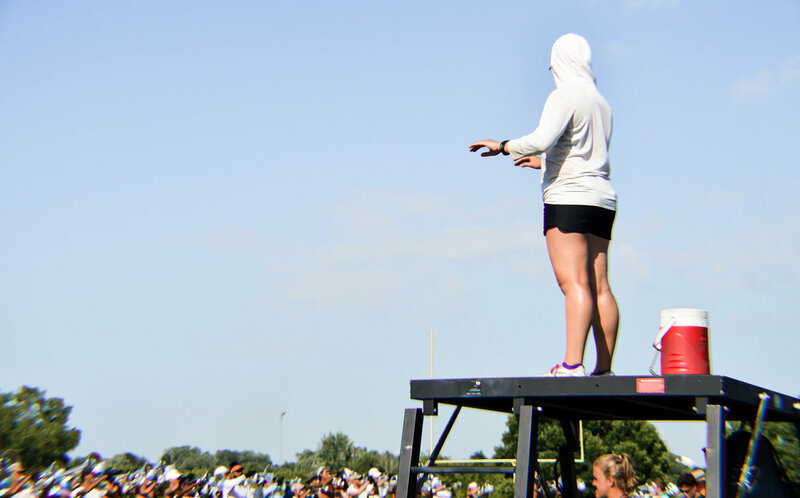 While it is consistently demanding, the admin position in drum corps isn't necessarily easily defined. "On tour, it's a little bit of a catch-all, depending on what each day brings," said Assistant Director of Operations and Tour Director, Rico Gomez. "I make sure that we can get from place to place--that all of our vehicles are in check and that everybody is taken care of." The Crossmen's administrative team is fueled in two parts: a front office team that works year-round to constantly power the drum corps, and a handful of rotating summer staff that work through the logistical bearings of Spring Training and tour. Each member of the team brings their own skillset to the group and allows for the corps to function as smoothly as possible. "All of the front office team is the food-planning team, the marketing team--everything," Gomez said. "It can get pretty busy, but there's a lot of creativity involved. Each year we hire a team of people to be our summer administrative team. They help us with all of the duties we have to get through the day. Whenever things happen, it's great to have a team of people who are dedicated to the drum corps and up for anything." And every day brings a new, unique challenge for the staff, ensuring that there is never a dull moment while on the road. From working on props to accompanying injured members to the doctor to making shuttling trip to and from the airport, the only consistent thing in drum corps is the inconsistency. "Day to day during the summer, I'm coordinating shuttles and making sure that our volunteers are in the right places," said Volunteer Coordinator, Chelsea Stamet Davis said. "It's my job to make sure that everything is covered so that others can do their jobs." The behind-the-scenes nature of the job is often so literal that it can feel like thankless position, but the reward comes as each person involved in the corps works toward the same goal: putting on a competitive show and growing stronger as a unit. "It's definitely eye-opening to see everything that's involved in taking care of the drum corps," said Gomez. "The payoff really is to see the members perform at the end of the day. It's always cool to know that you helped make that happen." Today, as the Crossmen push onto their next show, the administrative team will continue to work behind the scenes, bringing the show to life in a different, yet essential way. Greatness is rarely achieved alone. It often takes a village, and the Crossmen have one strong village behind them. Parades are a staple of drum corps. Many corps can be found involved in a holiday parade of some form or fashion each season. So when the Fourth of July rolls around, every member is ready to march down a series of closed-off roads and blast a catchy tune to the crowds gathered on the curbs. The Crossmen are no exception. They spent their Fourth of July performing in two parades--one in Skokie, IL and the other in Evanston, IL--playing The Final Countdown as crowds cheered and clapped along. To start the morning, the corps awoke a little differently. With the holiday in mind, the brass staff prepared breakfast tacos for the members, setting a lighthearted tone to the day. The members then departed and headed to the site of the first parade. By noon, the Crossmen were marching and in gear for the rest of the day. Below are a few photos from the how the Crossmen spent their Fourth. Following the parades, the members spent some time at Walmart and returned to the housing site for dinner. Tomorrow, the Crossmen will have a well-deserved free day in Chicago before getting back into the competitive drive for their next show on Friday, July 6. This week's featured member of the corps is Shelby Huffman. Shelby is a second-year marimba player for the Crossmen and the co-section leader of the front ensemble. He took some time outside of his morning to answer a few questions about the front ensemble and his experiences in drum corps. How did you get started playing mallets? I wanted to play four mallets, but couldn't find a teacher. I ended up watching youtube videos until I got the basics and then joined a local circuit group. This is my tenth year of being a percussionist. What's your favorite thing about the front ensemble? The coolest thing that I don't think most people realize is that we're actually pretty visual. Dancing is one of the most fun things you do in the front ensemble because you're jamming out to your own music. Even if the audience doesn't hear what you're playing over the brass, it's still an awesome time to dance around. I love it. What's your favorite thing about being on tour with the Crossmen? Everybody here is friendly. I like the people I work with and we work well together. That's something you need on your home team. What would you say to someone who wants to march in the future? Don't have self-doubt. Even if you think you're bad, it doesn't matter. Drum corps isn't about your skill level, it's about your self-growth and how much you choose to grow. What is the most important lesson that drum corps has taught you? The coolest thing I've ever gotten from drum corps is how I've grown as a person. Before drum corps I was pretty introverted and now I'm pretty extroverted. Drum corps is a great place change yourself to become a better person. White or wheat bread for PB&Js? I like mixing the green and blue. Visually and taste-wise, it's a solid choice. With shows for the next three days, the Crossmen have a busy competitive schedule ahead. Check back on Monday to keep up with the corps in the next installment of Letters from The In Between. The Crossmen have been on the road for over a week, now. With two performances down, the corps has established momentum and is continuing to clean and perfect show while moving across the country. The steady rhythm of tour is slowly setting in, as members begin to experience everything that the intensity of Spring Training prepared them for. And while the corps is continuously working to improve, little moments away from rehearsals have given everyone some behind-the-scenes glimpses of everything that goes into making drum corps possible. Yesterday, the corps took some time away from the field to visit the Fred J. Miller Uniform headquarters in Miamisburg, Ohio. While there, the members played a stand-still of the show for the employees and toured the factory where their uniforms were made. "I liked getting to perform for all of the workers there," said trumpet player, JonDavid Person. "On the tour, it was awesome to see how everything was made and how the factory functioned. They had all these different uniforms that they had made lined up. It was really cool to see." A few of the color guard soloists were even able to meet the individuals who made their uniforms. "It was really cool getting to meet the person who made my uniform," said color guard soloist, Katherine Harber. "I'm putting so much work into the show and I get to wear that uniform that she put so much time and effort into." Putting names and faces to the uniforms gives the members opportunity establish a more personal connection with the company, as well as a deeper appreciation for everything that goes into the marching arts community. The Crossmen now have a string of rehearsal days until their next show in Muncie, Indiana. The In-Between is getting better each day, and the competitive drive of the corps is only growing. Check back on Friday for the next installment of Letters from The In Between. Yesterday morning, the Crossmen received their member necklaces for the season, continuing a long-held corps tradition. Each year, the corps gives necklaces to members and staff after the first competitive show of the season to wear proudly as a symbol of the Crossmen. The cross, which has four equal sides and depicts the corps's colors, depicts a type of unity that both current members and alumni can connect to. Each side of the cross represents a different attribute that the Crossmen work to maintain and improve throughout their time in the corps: mind, body, spirit, and discipline. The corps spends time learning about the attributes of the cross before their first show. Once they receive their crosses, they have a deeper appreciation of the corps and the values that go into the Crossmen family. Mind and body go hand in hand. Each are tested throughout both Spring Training and the competitive season. Members work to protect their physical health and build relationships with each other to preserve the mentality and positivity of the corps. Mental and physical success are key factors in ensuring that the corps performs to the best of its ability. The spirit of the Crossmen goes much deeper than just the members. The necklace connects them to a family that goes back for generations of alumni and supporters that want to see the corps succeed. Current members are continuously carrying on their legacies by honoring them through the cross. Discipline is a characteristic essential to the wellbeing of the corps. On the cross, it is a reminder to stay focused both on and off the field--as both performers and members of society. 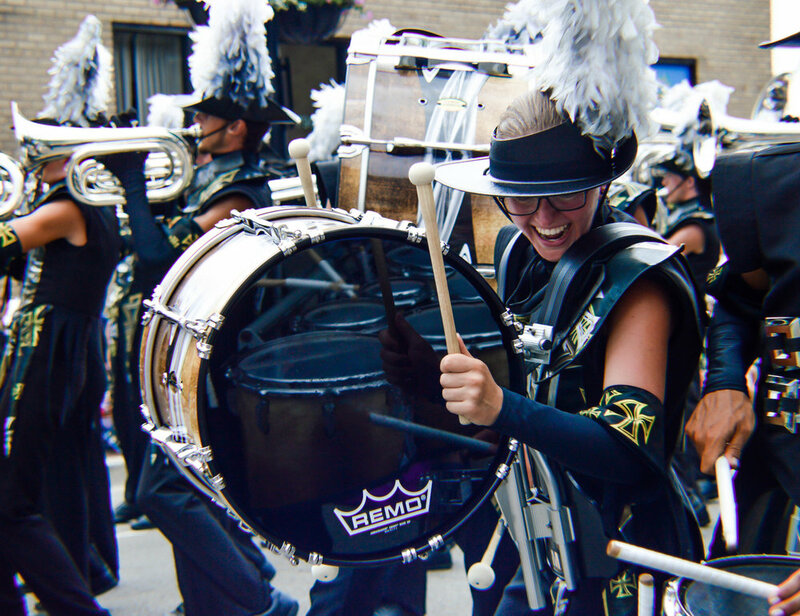 The lessons that drum corps instills in each individual can be taken out of the drum corps realm and into the work-place, collegiate setting, or any situation that members might encounter after the season is over. Now that the corps members have received their necklaces, they continue to move forward, unified and ready to compete at the highest level. They have spent the past five weeks working diligently to earn the cross. Now, they work to maintain the legacy that comes with it. The competitive season starts today. We're ready--are you? For today's spotlight, we highlighted the cymbal section. The 2018 Crossmen cymbal section is made up of four members: Ben Kurtze, Ian Anstaett, David Peterson, and Matthew Overly. Ben and Ian are both second-year members, while David and Matthew are rookies. We sat them down to talk about cymbals, tour, and the 2018 production. What has the 2018 season been like so far? How has the staff been this season? What's unique about playing cymbals? What are you excited for about this season? What has drum corps taught you? Come check out the cymbals and the rest of the Crossmen at a show on tour this summer! The Crossmen's debut competitive performance is only days away. To prepare for the excitement surrounding the start of the season, we asked a few of the members how they're feeling about the upcoming show. Q: What are you most excited about for the first show? "I'm excited to finally do drum corps in the way that I've seen it done for years." "This is my first ever drum corps show and it's also my home show. I'm really excited to see my family and I can't wait to show them what I've been doing." "We've been working really hard on the whole production for the last month and I'm really excited to hear the crowd react to a show that's so excellent." "I'm most excited about inspiring the kids that are watching. I once was on the other side watching drum corps and now I'm here inspiring other kids." "I'm most excited to share the show with so many other people. Once we get to the impacts in the show, it's something that I can really connect to." "For the first show, I'm excited to give my energy to the audience and get it back in return." "I'm excited to see all the people out there ready to support us. We've been working so hard in front of empty stands, so I'm ready to see people rooting for us." "I'm excited to debut the show in full uniform where everybody can see us. I'm ready for us to come out on fire for the competition." "I'm excited to have the first show in Ohio. I go to Ohio State so I have a lot of friends and family up there and I can't wait for them to come out and see me perform." "I'm excited to see the crowd stand up after the opening hit. I think once that sets in, it's definitely going to be unforgettable. We get to play really, really loud and I haven't heard a loud crowd roar since finals of last year. I'm excited for that." The Crossmen are officially on tour and on their way out of Texas. 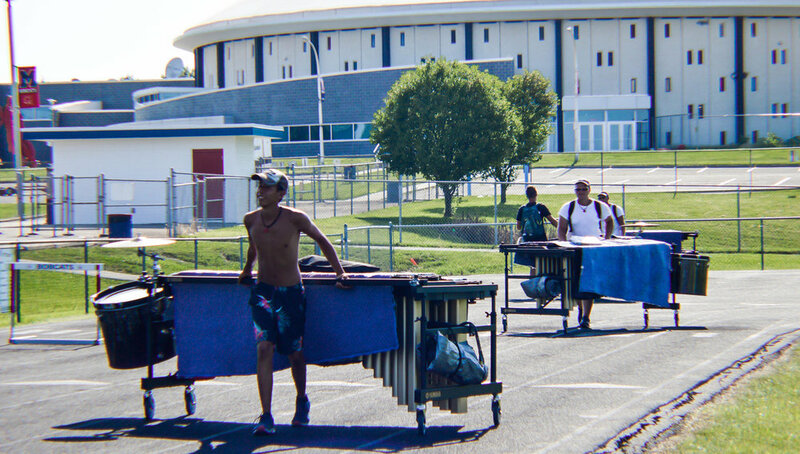 But before their first competitive show in Ohio, the corps has a few rehearsal days on the road. The first stop is Godley, Texas. Below is the first full day on tour, documented through a few of the little moments. Morning block. Sub-sectionals and cleaning. Lunch. Resting, reflecting, and ready to keep moving. Afternoon. A little more time for sub sectionals, as well as brass and percussion ensembles. Thanks to our incredible parents, the corps was able to enjoy pizza for dinner. Full ensemble, rounding out the last block of the day. Eat, pack, load, and onto the next. Next stop, Arkansas. If you've kept up with Letters from The In Between thus far, you know that today is a big day for the corps. Today at MMX, the Crossmen will be debuting their 2018 production. In addition, MMX will showcase performances from San Antonio Chamber Winds, Biohazard Brass Band, and the eXperience Day campers that have spent the day learning from Crossmen instructional staff. For the past four weeks, the members have poured countless hours into preparing this show and on Sunday, the corps will pack up and leave Heroes Stadium to embark on their 2018 tour. The performance mindset and work ethic that they have put into Spring Training will finally begin its payoff. But the road is far from over--in fact, the competitive portion of the season is just beginning. The stage is set, the show is finished, and the members are ready to compete at the highest level. If you have the ability, find your way to a show this season. You won't want to miss what the Crossmen have prepared. 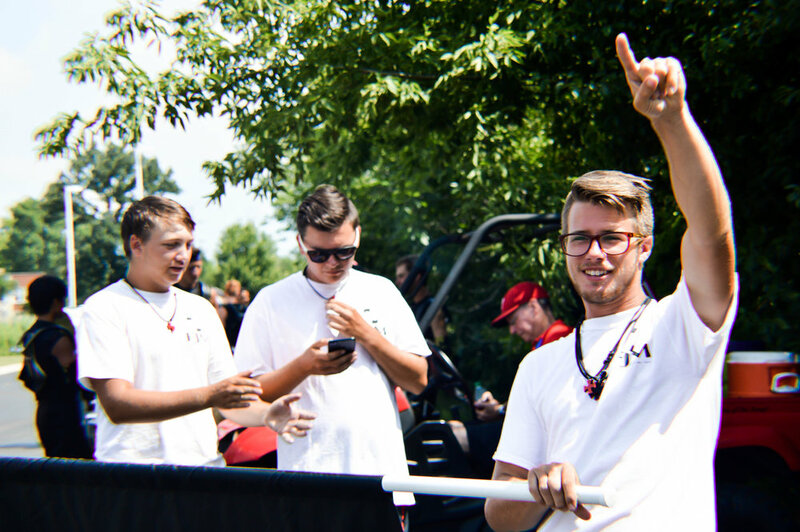 The Crossmen DMX camp is an annual four day camp hosted by the Crossmen for high school-aged Drum Majors to come and learn about how to better their ensembles at home while improving their own leadership and musical skills. Throughout the week, campers have been shadowing the Drum Majors and learning valuable leadership skills and techniques to apply back home. Led by current and former Crossmen Drum Majors, the kids have been able to get a glimpse of what being a Drum Major is like in a world class drum corps. "The campers have been in master classes and observations," said Randall Himes, second year Crossmen Drum Major. "They’re learning salutes, commands, conducting and communication techniques--things that they can bring back to their high schools. In some of their free time, they get to come and watch us as Drum Majors here apply the skills that they’re learning to an actual ensemble." And while the kids are learning new skills from their time at the camp, the entire experience also provides the current Crossmen Drum Majors a different angle to interpret their own leadership skills during rehearsals. "All of the eyes on us help us rethink the things that we’re doing here to make sure we know that what we’re doing is actually best for the ensemble," Himes said. "When we have another perspective from when kids ask questions or point something out, it makes us better too." Throughout the entirety of the camp, the Crossmen Drum Majors are hoping to instill a set of lasting skills into the campers that they'll be able to apply directly to their own situations. "I hope they can take home how they set expectations from the beginning and enforce those," Himes said. "A lot of the questions that we get are about respect and getting the message across. The answer to that is setting the expectation early—put your foot down when you know it’s the right thing to do and help make the ensemble better." Simply knowing about what makes an ensemble work is ineffective until kids are able to break down the concepts and use them at their own schools. The ability to help campers develop leadership skills in a real and applicable way is what the DMX camp aims to do. The DMX camp will continue throughout the week before concluding at Crossmen's MMX event on Friday, June 15. There, campers will have the opportunity to present the skills that they've learned to the public before Crossmen's debut of The In Between. Each year, the Crossmen take an evening to sit down and learn about the history of the corps. History night is a night where alumni and members reunite, enjoy cookie salad, and listen to a handful of speakers that reflect on their time with the corps, as well as encourage the next generation of Crossmen to carry on the legacy. The Crossmen were built out of a merger between the 507 Hornets and the Keystone Regiment, two smaller corps from the Pennsylvania area. History Night, in that sense, tells the story of two corps and their desires to compete fiercely as well as enrich the lives of young performers across the country. "We are extending a history that's bigger than most people realize," said Tour Director, Rico Gomez. "This is an opportunity to pass down a legacy to a new generation. We want this to carry on long after we're gone." And throughout ups and downs from the corps early years, the passion from the people involved are what have kept it alive and thriving from 1974 to 2018. "This is what I like about drum corps," Gomez said. "History Night might not be the most glamorous, but it's neat to see how much this group has overcome." This year, History Night stayed true to tradition. On Saturday night, the members were able to sit down and learn about the corps's roots and evolution throughout the years. Some received alumni-funded scholarships, and the corps flag was passed down to the current Horn Sergeant. Chris Daniels, first year front ensemble member, reflected on his first History Night as a member of the corps. "I think that the corps has a lot of really great history," Daniels said. "It was cool to hear about when Crossmen helped Spirit of Atlanta. It's awesome that the corps was willing to go out of their way to help others." And while new members learned about the origin of the corps, the legacy that has built our foundation was strengthened. "My favorite part about the evening was learning about how Crossmen was formed by two smaller corps coming together," Daniels said. "I liked hearing about all of the ups and downs that the corps went through." History Night was also an eye-opening event to many. Members were able to reflect on both the history of their own corps, but also on the history of drum corps. "History night shows that Crossmen is more than an organization," Daniels said. "It really shows the depth of not only the Crossmen, but of DCI as a whole." The events of History Night may stay consistent each year, but the evening means something special to everybody. Bringing the corps together for a night of reminiscing and motivation allows for the gap between old and new Crossmen to dissolve as the corps bands together as a family. Our next member spotlight of the season goes to the 2018 Horn Sergeant and contra player, Diego Chavez. 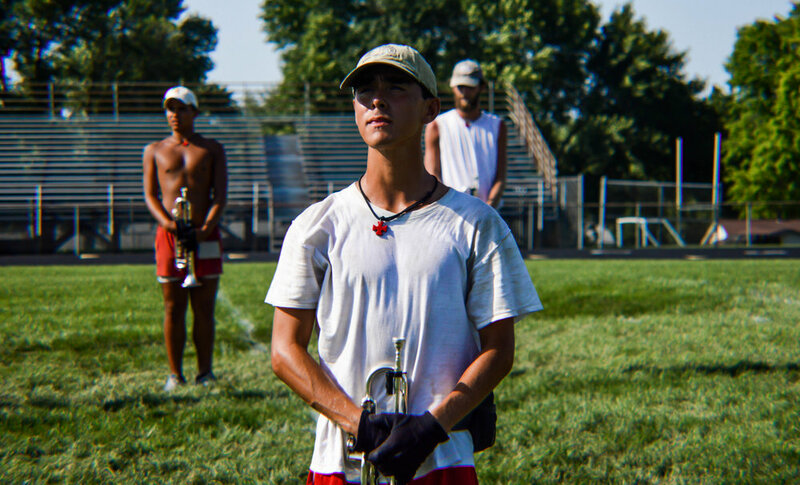 Diego is 20 years old and in his fifth season with the corps. He answered some questions about his role as horn sergeant, the 2018 season, and gave us a few fun facts about himself. I haven’t done band outside of drum corps for the past three years. What has your role as Horn Sargent been like this year? It’s been good. It can be difficult because we’re trying to lead the horn line in a direction we’ve never really gone before, but so far it's well. They're progressing at a really good rate. What's your favorite thing about Crossmen? Definitely the people—the relationships that you make. I don’t know a lot of people that enjoy the hot sun, the work, and the long hours. You definitely stay for the people. What's your favorite DCI show? I really like 2005 Cadets (The Zone). Smelly, humid, fun. Oh, and sweaty. Sweaty’s the biggest one. What is the best type of jelly for a pb&J? What's the best Disney soundtrack? What are you most excited about for the 2018 season? Since we’ve had four weeks of Spring Training instead of three, I feel like we’re really ready to come out of the gate swinging. I think that first show is going to be on fire. It’s going to set us up for a really good season. Behind every great team of performers is another team of hardworking, innovative designers. And with the intricacy of many of today's DCI shows, the process that goes into show design is no different. Each year, it takes a group of talented and dedicated individuals to envision the production that performers bring to life on the field. Ed Devlin, Program and Staff Coordinator for the Crossmen, sat down to talk about his role with the corps, the show design process, and the 2018 Crossmen. My role here is two parts: Program Coordinator and Staff Coordinator. Program Coordinator is responsible for all of the artistic portions of the program and Staff Coordinator is more logistical--making sure the captions are set up and understand all the policies of the corps. Every year, we'll sit down in September and go over the positives and negatives of the past season. Through that, we can set a course for the coming season. We talk about music, concepts, and visual ideas. This year we went with some musical ideas and then set the concept to that. What are some unique challenges in designing a DCI show as opposed to a WGI show? The stage. In WGI (Winter Guard International), it's very intimate and the scope of the DCI stage is so much bigger than in an arena. Everything that we do on the football field has to be much more exaggerated so that you're still communicating to the audience. The biggest challenge is understanding that what you design in the winter isn't necessarily going to work outside. Do you come into each season with a specific mentality or does it vary by year? I think we go into it every year just wanting to create a good show. There's not necessarily a specific mentality that we go into the process with, but we always want it to present a challenge to the performers and keep the audience engaged. I'd say this show is very intriguing. It's a little bit of a turn for the Crossmen--a different approach this season, but it will connect with our audience. Did having the same design team returning make the show design process easier? Absolutely. Having continuity in both the design team and caption heads is key. We're two years in with this design team and these caption heads, so there's been a good communication between everybody. What’s your favorite part about working on DCI shows? Both DCI and WGI provide opportunities for young adults to showcase what they can do. To be able to be a part of that and to work with the design teams is my favorite part. Helping provide opportunities for the members is my driving force behind doing all of this. With Crossmen entering week three of Spring Training, the corps has just passed the halfway mark until the start of the touring season. While the performers are feeling the heat of Spring Training, they've stayed busy thus far, gearing up for the debut performance of The In Between. Saturday, members enjoyed an opportunity to do laundry as well as a much-deserved free day at the San Antonio Riverwalk. And in addition to the show premiere, members can look forward to History Night on June 9th, where they will learn about the evolution of the Crossmen and connect with performers who came before them. Mika Veloz, a four year member of the corps and a 2018 age-out, took time to talk about the recent free day, History Night, and the mentality of the corps this far into Spring Training. "I think we're all pretty exhausted," Veloz said. "Realizing that we're almost through learning the show and that we're halfway done with Spring Training is helping us to keep pushing. Everyone's tired, but we can see the light at the end of the tunnel." While the corps is understandably tired, the free day is an important factor in the wellbeing of the members. Not only are free days opportunities to take a break from drum corps, they also play an important role in strengthening relationships between the members outside of the marching arts spectrum. "I realize the point is just to rest," Veloz said. "I think free days are a lot more relaxing now because of that. It's really cool to see people outside of rehearsal and talk about things other than just drum corps." Regarding History Night, Veloz stressed the importance of remembering where the corps comes from, and to understand how it has changed throughout the years. "There's only one Crossmen," Veloz said. "Not a lot of drum corps have been around as long as we have. We're kind of a scrappy corps when you actually learn about the history and I think it's important to remember that." Tradition within the corps is also another well-respected factor. No matter how many years separate members past and present, the unity of the group is what brings them together as a family. "The coolest thing for me is to remember how many years of Crossmen have come before me," Veloz emphasized. "There's so much tradition and I think that's something unique to Crossmen. It's always cool to see where we came from." Looking ahead, there is much more work to do. With History Night just six days before MMX, Crossmen's preview show event, the members know that the final push is just ahead. For now, we look back at the drive that built the organization so that we can advance with a determination and grit to further its reputation. Our first member spotlight of the season goes to Susan Biscardi. A member of the color guard, this is Susan's fourth year with Crossmen. She took time outside of rehearsal and answered a few questions about membership, the season, and her experience with the corps. What's it like being back for Spring Training? It's very hot, but I'm so glad to be back here and be with all of my friends and family who I haven't seen since August. It's hard taking nine months off, but being back and with everyone again is great. How did you get involved with Crossmen? I marched open class for two years and my caption head had marched Crossmen. She always told me how amazing it was and how great the family was, so I came to Texas. Definitely the family environment we have. Everyone is so close and everyone cares so much about each other. And that's not just the members--it's the staff, the admin. It's just a great environment. What has been your favorite year with the Crossmen so far? Probably 2015. It was such a light and happy show to perform. I think the crowd really enjoyed it. What's the general mood amongst the guard? The guard is working very hard. We're all ready to start performing and everyone's super excited for the season. What can people expect out of the 2018 show? The show is a lot different than years past. From the drill to the music, we're doing a lot. Do you prefer tour or spring training? Tour. I like the change of scenery. Seeing all of the football fields across the country is much more interesting than just one. Front of the bus or back? Front. Gotta get off first. What's one thing about drum corps that you think everyone should know? It's such a different experience than anything else. You get three months just to focus on the activity that you love and I think that's such a cool experience. What's a piece of advice you would give to someone who wants to do drum corps in the future? Don't be afraid. Reach out and make new friends. It's hard when you don't know anyone, but after the season, the things you take with you are the relationships. What are you most excited about for the season? I'm excited to start performing. I think that the different type of show we're doing is really going to intrigue the audience. I'm excited to put that on the field and show people what we've been working on. The community that goes into the Crossmen is made up of so much more than just members. There is, in fact, an entire community involved in its success. Tonight was a fantastic example of how much support is rallied around the members of the ensemble on a daily basis. Thanks to an incredible group of parents, the corps was able to enjoy catered pizza and Kona shaved ice for dinner. With temperatures continuously rising in the heat of the San Antonio sun, the refreshment of the evening was enough to put a smile on everyone's face. Not only did the performing members enjoy the pre-ensemble treat, but staff members and volunteers were able to partake as well. The generous donation from Crossmen parents helped bring everyone involved with the corps together as a family. With the investment that goes into the wellbeing of the Crossmen family, the corps is able to thrive with a unity and camaraderie that brings them together as one. This organization is powered by countless staff, volunteers, and parents that put continuous effort into making the Crossmen the best that it can possibly be. Thanks to the generosity and support of everybody involved, the member experience only continues to improve. So thank you, Crossmen parents, volunteers, and supporters, for reminding our members of the community behind them. Your unified support has helped them to grow as individuals and succeed as an ensemble--all while becoming a family.